Ex-Arsenal Women's keeper Emma Byrne will become the first female inductee into the Republic of Ireland's Hall of Fame in Dublin on Sunday. 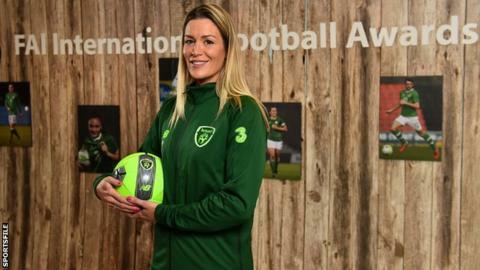 Byrne, who won a record 134 Republic caps between 1996 and 2017, will get the honour at the Football Association of Ireland's International Awards. The FAI recently dedicated a tribute alcove to Byrne at their headquarters. "Emma has earned her right to be described as an Irish legend," said FAI chief executive John Delaney. Damien Duff, Robbie Keane and Tony Cascarino are the most recent inductees to the FAI's Hall of Fame, while other previous recipients include Andy Townsend, Ronnie Whelan, Ray Houghton and Liam Brady. "Emma was a fantastic goalkeeper and ambassador for the women's game," added the FAI chief executive. "She deserves to have her name in the Hall of Fame, alongside some of the best players ever to represent Ireland." Byrne's senior international career, which began as a 16-year-old against Belgium in March 1996, included a four-year stint as Republic captain. FAI board member chairperson of the women's football committee Niamh O'Donoghue described Byrne as a "fantastic servant to the women's game". "She was a tremendous role model for young girls around the country and I've no doubt that she inspired an entire generation of girls to follow their dreams of becoming a professional footballer," said O'Donoghue. "The tribute alcove in FAI headquarters is fantastic to see and anyone who visits the offices will be able to see just what she achieved. "However, becoming the first women's player to be inducted into the Hall of Fame is historic and well deserved." Byrne's 16-year Arsenal career saw her win nine FA Women's Cup medals while she also helped the North London club clinch the Uefa Women's Champions League in 2007. After being released by Arsenal in 2016, she joined Brighton & Hove Albion Women before announcing her retirement from the game in August 2017.